In a medium bowl, mash together the achiote paste, garlic, orange juice, lime juice, bay leaves, cumin, cinnamon, thyme, oregano, salt, and pepper with a fork. Add the pork, toss to evenly coat, and marinate, at room temperature, at least 4 hours. Preheat the oven to 300°F. Heat a large, dry cast-iron skillet over high heat. Char the onion until blackened on both sides. Then char the tomatoes on both sides. Reserve. Line a large baking dish with one layer of the banana leaves or foil. Arrange the pork in an even layer and top with the onions, tomatoes, chiles, and all the marinade. Cover with more banana leaves and wrap the dish tightly in foil. Bake 2 1/2 to 3 hours or until the pork is tender and moist. Remove from oven, let sit 10 minutes, and then unwrap. Using two forks, shred pork into bite-sized pieces. Place warm tortillas on a work surface and top with a layer of black beans. 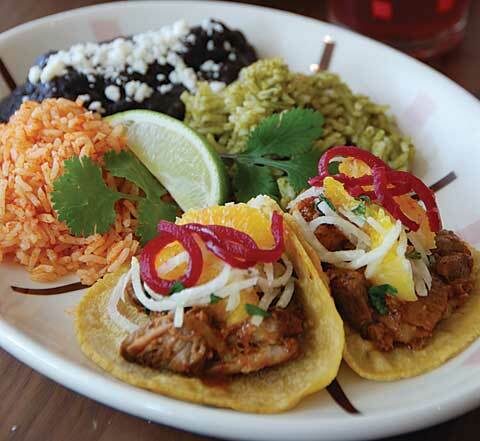 Add shredded pork and top with guacamole (if using), Orange Jicama Slaw, and Pickled Red Onions. Serve immediately. Fresh chiles can be roasted over a gas flame or under the broiler. Keep turning so skin is evenly charred, without burning the flesh. Transfer charred chiles to a closed plastic bag and steam 10 to 15 minutes. Pull off charred skin by hand and dip briefly in water to remove blackened bits. Once peeled, cut away stems, seeds, and veins. *To supreme an orange: Cut away the top and bottom of the orange and set it on a flat surface. Using a sharp knife, cutting from top to bottom, remove the peel and membrane on the surface of the orange. Remove each segment of orange without any of the membrane by using your knife to slice down on each side of each segment to free it from the membrane. Combine ingredients and let sit for at least 30 minutes before serving. Place onions in a medium saucepan and pour in enough water to cover. Bring to a boil, and remove from the heat. Strain and set the onions aside.